By 1983, it was starting to become clear that the freight train of slasher flicks wasn’t about to be derailed anytime soon; not only were there hordes of Halloween and Friday the 13th imitators, but those series had also begun to spawn sequels. However, none of these offerings looked quite like Psycho II, which aimed to follow up a classic two decades after the fact. Perhaps only Halloween III (which saw the franchise shift gears midstream) can rival it as the genre’s most audacious sequel at the time and confirmed that Hollywood at least certainly goes a little mad sometimes. Somewhat surprisingly, the gambit paid off, as Psycho II is a stunningly solid effort in a capacity where no one ever expected any sort of effort since Hitchcock’s original film hardly lends itself to a sequel. Perhaps even more impossibly, it snagged two stars from the original in Tony Perkins and Vera Miles, here reprising the iconic roles of Norman Bates and Lila Crane-Loomis in truly fascinating fashion. It begins expectedly enough, with Lila protesting the imminent release of the now cured Norman, who is set to return home 22 years after committing his horrific crimes. There’s a little bit of a schmaltzy, made-for-TV quality to these proceedings that are a little disconcerting, and it almost feels like Miles was coaxed into returning for an early appearance to better connect the film to the legacy of the original. However, once Norman arrives back at the Bates abode, the film finds its sinister footing. Someone purporting to be Norman’s long-dead mother begins leaving him notes that start to push him to the edge of sanity, which makes for a really tough readjustment into society. It doesn’t help that the guy in charge of the family business is a scumbag that’s turned the Bates Motel into a roadside sleaze haunt, nor is it particularly easy to take a job at the local diner when everyone’s expecting you to lose it. Co-worker Mary (Meg Tilly) is one of the few who isn’t all that wary, even though she is just a little on edge about accepting his invitation to spend the night. And, of course, a rash of murders and disappearances breaks out, with everyone obviously suspecting Norman. Such a conclusion is so obvious that one has to expect that something else is actually up, just as it was back in 1960. This much is revealed to be true, but, to its credit, Psycho II isn’t all that interested in repeating the formula of Hitchcock’s original, save for its similar reliance on a mid-movie twist that deftly reintroduces Lila to the story. It turns out that she may be in the process of confirming Norman’s insistence that “we all go a little mad sometimes,” as she’s hell-bent on returning him to psychiatric care. No longer content to petition the court, she’s enacted a loony plot to cast suspicion on Norman by “resurrecting” Norma in his mind, and it plays out about as weirdly as you might imagine. In fact, it’s difficult to recall any other sequels that aggressively shake up the status quo and present an inversion like this one. 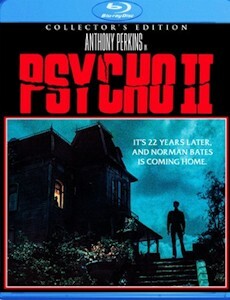 As the slasher cycle wore on, its many of its long-running franchises saw its villains transition into anti-heroes, but Psycho II goes all the way with Norman by reconfiguring him as a totally sympathetic victim. Rather than stick with Hitch’s sinister insistence that Norman represents pure evil (a contradictory grace note to the psychobabble of the film’s penultimate scene), Psycho II actually trucks with a more modern sensibility that finds him not guilty by reason of insanity and supposes that he could actually be rehabilitated. Perkins is disquietingly effective in this mode; despite his weathered countenance, he’s still that weird, insecure kid that used to run the Bates Motel. His performance is appropriately awkward and even a little stilted at times because he truly feels like a guy trying to become comfortable in his own skin again; typically, pulling back the curtain on cinematic psychos is underwhelming, but Psycho II paints a fascinating portrait of Norman Bates that doesn’t just write him off as an unrepentant nutjob. It’s an unexpected turn, but it’s one that mostly works, especially since the film doesn’t completely dismiss his fractured psyche by the end. Meanwhile, Miles feels about a half-step removed from a psycho-biddy flick as the now nigh-unhinged Lila. While she doesn’t exactly become a surrogate for Mrs. Bates, she’s definitely not completely sane, and her plot takes the film in some wild territory by the end. In an effort to keep up with the Jonses, it does take a few slasher diversions (a scene featuring a couple of teens looking for a place to make out feels like it could belong in any Friday the 13th movie), and the gore is expectedly amped up in a couple of cases. For the most part, however, Psycho II doesn’t completely yield to the schlocky body count trend of the era but instead takes more of a cue from 70s gialli. At its core, it’s a whodunit, and, in true giallo fashion, it’s revolved in a clumsy, almost soap opera manner that still manages to satisfy because the conclusion is so nutty (any movie that ends with an old lady being cold cocked with a shovel is just a little bonkers). Few directors would want to follow in Hitchcock’s footsteps, but Richard Franklin does so with gusto; he’d already been circling Hitch for years (Roadgames is Hitchcock on 18 wheels), and, when given the opportunity to actually take up the mantle, he doesn’t disappoint by helming Psycho II with confidence. He and Dean Cundey appreciably don’t try to completely recreate Hitchcock’s style, nor does he ask composer Jerry Goldsmith to reheat Bernard Herrmann’s old score, which is perhaps emblematic of the approach at large: Psycho II isn’t a lazy stroll back to the Bates Motel but rather a genuine attempt to advance a story that didn’t beg for a continuation. Maybe the world didn’t need Psycho II, but Franklin and company actually bothered to make it worthwhile. Thanks to Scream Factory, Psycho II will be making its high definition debut on a Collector’s Edition that represents a fine upgrade over Universal’s previous standard-def efforts. The transfer does Cundey’s work justice, particularly the moody establishing shots of the foreboding Bates mansion. Both the original stereo mix and a 5.1 re-master are rendered losslessly via DTS-MA tracks, with the latter actually serving as a faithful remix in that it’s not too gimmicky or unnatural. Psycho II is also graced with special features for the first time; while Scream hasn’t commissioned its own signature retrospective for the title, it has included a 30 minute vintage EPK promo that features interviews with the cast and crew. The material is sort of quaint, though it does reveal that everyone was keenly aware of the risk involved (as the feature points out, there had never been a sequel that arrived two decades after the original at that point). Viewers also have the option to watch the film with more vintage audio stuff from the cast and crew, or they can opt for a commentary with screenwriter Tom Holland and moderator Rob Galluzzo). The usual promo stuff (trailers, TV spots, a stills gallery) round out the disc, which is a must-have for Psycho fans; anyone who has ever written it off as an unnecessary sequel should also check it out.